With 5 depots scattered across England, Scotland and Northern Ireland, ND Brown are the go to company to call upon for affordable and reliable tipper hire. Whether you are moving large quantities of waste, soil or gravel, we can offer you a flexible range of hire options; this includes both short or long term rental. We have more than 30 years experience supplying and operating numerous vehicles across our fleet; we can assure you that we will do everything possible to help your project to run as smoothly as possible and at a competitive price! Whether you need masses of material to be moved, or just the security that a small job will be sufficiently completed, we can supply a range of tipper hire vehicles. The tippers are available with different capabilities including different sized tippers. We operate contracts for short or long term use; we also offer open ended contracts as we know not everything can always go to plan. Operators can also be provided, or if you would prefer, you can choose our self drive option. With a massive fleet and conveniently placed depots there is no area that we can’t supply our tipper hire to. 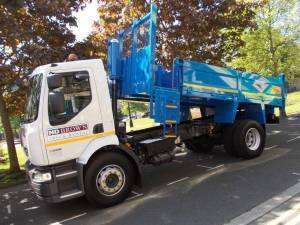 We generally supply three types of tipper, cage tippers, tipper grabs and the standard tipper. At ND Brown we are dedicated to ensuring that your project is never problematic. This is why we will provide you with unrivalled customer support; from the initial enquiry, through to the return of your vehicle you’re guaranteed a pleasant and convenient experience. So, if you require expert tipper hire for your project, then please contact us today. We can provide you with professional advice and a competitively priced solution.